One of the most rewarding experiences I have ever had was teaching introductory courses at my local university. In the process, I found myself on a two-way street where my students taught me a thing or two, and I showed them how a dreadfully boring theory or concept could come alive. Our topics essentially covered all of the developmental theories from the “womb to the tomb.” We began with topics on conception, and danced through more lively topics on relationships, family, and our individual roles in the greater system around us, and ending with death and dying. It was a lot of fun, challenging, and incredibly meaningful. Oftentimes I would use personal stories as a way to highlight and illustrate a particular theory or concept. As a teacher, I always wondered what impact I had on the students. Did my “innovative” approaches do anything? Did they really walk away feeling like they gained something more than just a letter grade? My focus has always been to create an environment for them to experience, and learn through the actual experience. It was a beautiful little surprise when I heard from a former student about this blog. And the timing couldn’t have been more perfect. I recently had lunch with an old friend about the possibility of getting on a local radio station to share this story, and I think I am well on my way. There are a string of bills relating to homelessness that have been revived, and the radio waves seem to be filled with conversations about the homeless. I couldn’t help but notice that we have yet to really hear from those who are directly impacted. I am hoping that maybe this is my opportunity to participate in the conversation. As I mull over which parts of my story I want to share, I continue to hear a little voice of doubt in my head. 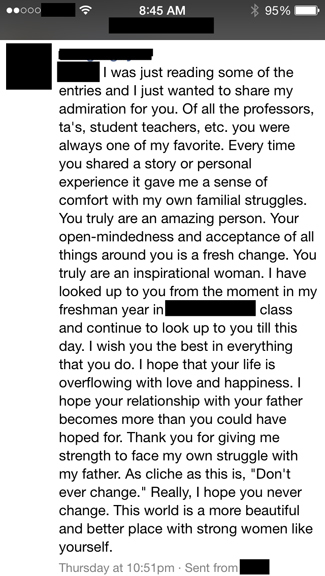 Despite the doubt and uncertainty I may feel, my former students’ message is a reminder to continue being open and share the acceptance that I have worked towards with my father. I do believe we are all here to make the world a little brighter, a little better, and a little warmer while we can. What goes around, comes around. Thank you DN for your beautiful message. I’ll remember it before I get on air! Your courage in transcribing this ordeal of care is astounding. My son was homeless for quite awhile; and in a hope of light for you, he has come home, is working on his mental health; preparing to succeed. My best to you and your Dad, as well as your extended ohana. Thank you so much for sharing your personal experiences with me. I am so glad to hear about your son. Words cannot express how deeply touched I am by those who have reached out in solidarity for the homeless. Hawai`i is a fairly small state, and every effort we make is magnified by the fact that we all have mutual friends and family somewhere down the line; we are so interconnected… thank you again for reminding me of that, and giving strengthening the hope I have for my father.